Researchers at Siemens have developed a portable biochip laboratory system for quickly checking water for pollutants. The tests use the reaction of antibodies to certain hormones, pesticides, antibiotics, or bacteria. The demonstration unit the size of a laptop identifies up to 25 substances and their concentrations within 30 minutes. The mobile laboratory could test water quality during humanitarian missions, for example, or monitor hospital wastewater. Water treatment plants monitor the pollutant content in drinking water by regularly subjecting samples to high-precision tests in the laboratory. There are smaller devices for these tests, but they frequently work with optical methods. The portable system from Siemens uses electrochemical reactions to make a rapid assessment on site. This offers the advantage that the systems can be built to be small, robust, and cost-effective. The heart of the solution is a biochip with antibodies on its surface. When these react with the corresponding substances in the sample, an electrochemical reaction initiated in a second step is measured as a tiny electric current on the chip. The Siemens chip is based on a development with Infineon and the Fraunhofer Institute for Silicon Technology that has already been honored with the German Future Prize. The researchers also developed a robust method for processing the sample fully automatically with the mobile lab, i.e., for applying the reagents in the proper sequence and amount to the chip, where they react with one another. The demonstration unit can currently detect the pesticide atrazine, for example, in concentrations of just a few millionths of a gram per liter, which is already very close to the statutory threshold. The system is still not sensitive enough to monitor drinking water for bacteria, for which the standards are even more strict. One hundred milliliters of water may not contain even a single coliform bacteria. In the future, filtration technologies will extract the germs from the sample in order to concentrate them in smaller volumes of water and then detect them. 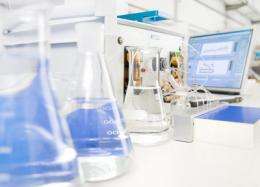 The researchers developed the pollutants laboratory in collaboration with external partners as part for the AquaSENS project funded by the German Ministry of Education and Research. 25 substances, lol... WOW!~ I'm so impressed!